In blood-red Texas, 19 border legislative races are up for grabs in 2010 — but Republicans are running in only 6. And only 2 GOP candidates have raised any significant cash so far. Republicans in this reddest of red states may have a lock on statewide offices, but when it comes to local races on the border, the GOP is having a rough go of it. This year, there are 19 border legislative seats up for election. Just six of the races feature GOP candidates, and only two of the 10 Republicans running have raised any significant cash so far. “It’s not just an uphill battle for any Republican candidate; it’s almost a perpendicular uphill battle,” says Jerry Polinard, a professor of political science at the University of Texas Pan American in Edinburg. The Republicans lost their only legislative seat on the border in 2008, when longtime State Rep. Pat Haggerty of El Paso lost his primary re-election battle against El Paso businessman Dee Margo. Democrat Joe Moody, a political novice, beat Margo in the general election, and now the GOP is working hard to get that spot back. But that race, with three GOP candidates vying for the nomination, seems to be the only one so far where they're putting up a strong fight. Polinard said Republicans on the border aren’t exactly invisible now, like they were back in the 1960s; they’re just hard to find. “The effort is largely in name only,” he said. “It just doesn’t make much sense for the Republican Party to put much resources into elections they’re likely to lose,” he says. The party made some significant progress in border communities in the 1980s and 1990s. In 1988, Tony Garza became the first Republican ever to win countywide office when he was elected Cameron County judge. And in 1998, then-Gov. George W. Bush won more than 50 percent of the vote in El Paso County. Those advances evaporated, though, in 2005 when the Republican Party took on illegal immigration as one of its top agenda items, Polinard says. In border communities like Brownsville and El Paso, where the population is 90 percent and 80 percent Hispanic, respectively, the crusades against immigration and in favor of building a border fence have not been positively received. The rhetoric has not only racial implications but also economic ones, because border communities are so inextricably tied to one another through tourism and trade, Polinard says. “Within about a five-year span, all that movement where Republicans were beginning to be able to pick up 40 percent of the Mexican-American vote just disappeared,” he says. In the 2008 presidential race, 64 percent of Cameron County voters chose Democrat Barack Obama, and so did nearly 66 percent of El Paso County voters. Bryan Preston, a spokesman for the Republican Party of Texas, says the party is trying to engage voters on the border by launching local grassroots networks to get Republican community leaders talking to others about the party and its values. “Rather than being something that comes out of Austin, it will be something that comes out of the community,” he says. But it’s tough to make that work when there aren’t many Republican leaders in those communities to begin with. “We’re still working on the plan,” Preston says. “It’s pretty new.” Despite the lack of a clear plan by the party to rejuvenate Republican interest on the border, Preston says GOP leaders are hopeful that the growing national tide of dissatisfaction with Obama will work in their favor come November. “I think that is going to shake out as enthusiasm ramps down on their side and ramps up on our side,” he says. Margo, who took out Haggerty in 2008 and is running again to represent El Paso’s Northeast and West sides, says chances are better this year for the GOP to take back the House seat. 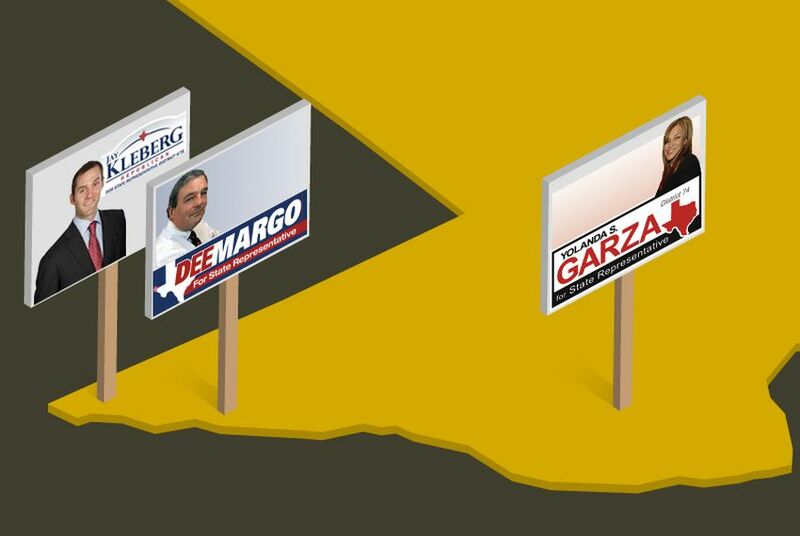 Margo is in a three-way primary race against fellow businessmen Jay Kleberg and L. Rene Diaz; the winner will take on Moody in November. Margo characterizes the Democrat’s victory in 2008 an anomaly (Moody got 51.5 percent to Margo's 44.5 percent), since a Republican had occupied the seat for more than two decades. The difference two years ago, Margo says, was Obama's coattails, but he thinks that won’t be a problem this year. Austin-based Republican consultant Bill Noble says the GOP also might have a good shot at toppling Democratic state Rep. Pete Gallego out in the Big Bend area. Two Republicans are vying for the chance to take on Gallego: Thomas Kincaid Jr. and former Del Rio school board member Yolanda Sotelo Garza. “It's a hidden gem for Republicans to pick up,” Noble says of Gallego's district. The area saw significant support in 2008 for Republican presidential candidate Sen. John McCain, who won 51.4 percent of the vote (in 2004, President George W. Bush got 61.2 percent). “It’s something that would be viewed as winnable in a year where voters are not turning out or are turning Republican after the last election,” Noble says.